Character, charm and colour…….and lots of it. 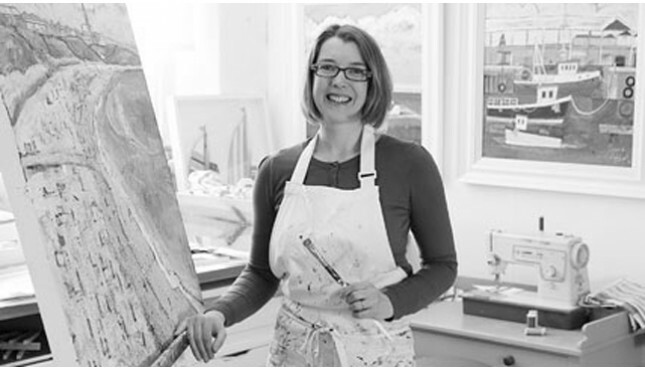 North East artist Joanne creates pleasurable works of art inspired by the British coastal environment. “I love the seaside and the North East coastline and thrive on capturing the character of our harbour villages, fishing boats, lighthouses, donkeys, beach huts and seabirds within my paintings. My aim is to make people smile and remember those wonderful family days out by the sea”. Joanne studied at Duncan of Jordanstone College of Art, Dundee and graduated with a B Des hons in Printed textile design in 2000. She started her career as a freelance designer selling Hawaiian shirt prints to the USA. In 2006 together with husband Ross set up “Wishart” a self publishing Art, Print and Greetings Card Company and they haven’t looked back! In 2009 she won a Female entrepreneur award for the North East of England’s Best Creative Business.